The now qualified components are the PAM1CAN, PAM2CAN and PAM1FLEX. CAN Bus, DeviceNet Bus and Flex Bus lines. ProTek offers three types of TVS Diode Arrays: Standard Capacitance(>100pF), Low Capacitance(5-100pF) and Ultra Low Capacitance( less than 5pF). In addition, ProTek's TVS Arrays product line provides protection from transients caused by Electrostatic Discharge (ESD), Electrical Fast Transients (EFT), Tertiary Lightning and other induced voltages. ProTek offers TVS protection in very small chip scale packages. These space saving devices are ideal for use in portable electronics such as Cellular Phones, Cellular Phone Accessories, Laptops, and PDAs. 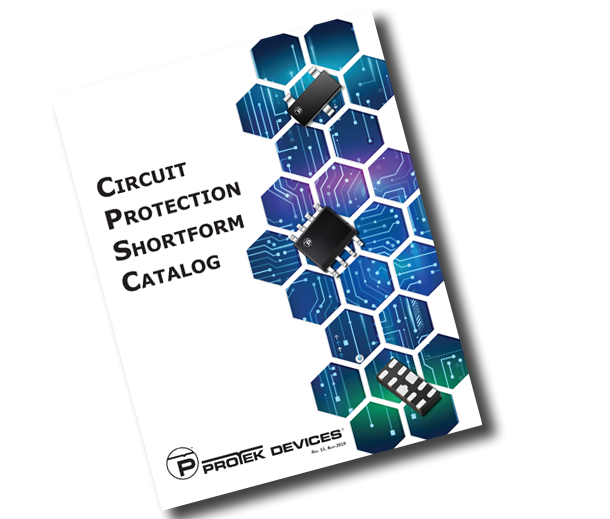 ProTek designs products for a wide array of markets including telecommunications, consumer electronics, computing, industrial, medical and aerospace/military. Discover the optimal solution for your application. Smartphones, LED Monitors, Game Consoles and more. Reliable protection for harsh environments. Broadband, Customer Premise Equipment and other network devices. Sensors, POS, SmartMeters and more. Sensors, Audio/Video, Climate Control and more. CT Scan System, Patient Monitors, Pacemakers and more. Looking for a product datasheet? Use our Datasheet Search Tool. Looking competitor part number? Use our Cross Reference Search Tool. Looking for environmental compliance? Use our "Green" Product Search Tool. Looking for a specific paramter? Use our Parametric Search Tool. Looking for a particular footprint? Use our Search By Package tool. The knowledge base section features an array of technical information to help you implement our circuit protection solutions into your application.